Alzheimer’s disease is a neurodegenerative disorder that attacks the brain’s nerve cells, or neurons, leading to cell death and degeneration. The most common symptoms of Alzheimer’s disease are the memory loss, incognition, disorientation, behavioural changes, personality changes, and trouble in speaking and writing. The Alzheimer’s disease (AD) mainly occurs in the adults with aging mid-sixties, which leads to 60% to 70% of cases of dementia. The major causes of Alzheimer’s disease are genetic disorders and the disease process associated with plaques and tangles in the brain. The diagnostic test for Alzheimer’s disease includes cognitive testing with medical imaging and blood tests. Alzheimer’s disease risks can be overcome by mental and physical exercise and avoiding obesity. The global Alzheimer’s disease treatment market is expected to grow at a significant CAGR due to increase in the prevalence of Alzheimer’s disease. According to World Health Organisation, escalation of the geriatric population leads to increase in Alzheimer’s disease cases, which in turn affect the Alzheimer’s disease treatment market positively over the forecast period. 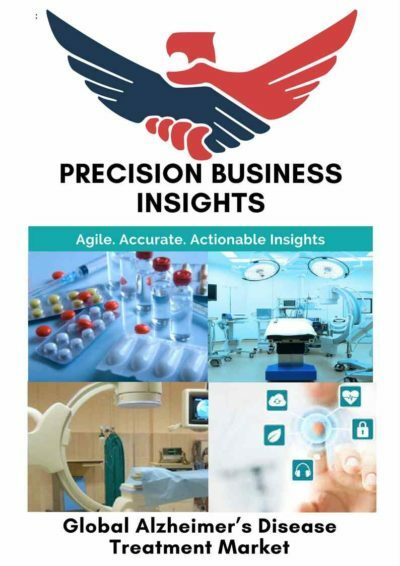 Apart from this, increase in healthcare spending and R&D investments in the global Alzheimer’s research, expiration of patents, and entry of new generics into the market expected to fuel the growth of Alzheimer’s disease treatment market. Similarly, the discovery of new disease modifying drugs, and presence of vast last-stage pipeline drugs expected to boost the growth of Alzheimer’s disease treatment market over the forecast period. However, the limited number of treatment options for Alzheimer’s disease in the market, challenges in precise diagnosis and even detection of Alzheimer’s disease, and lack of funding from government in developing economies for research might hamper the growth of global Alzheimer’s disease treatment market over the forecast period. Moreover, the high degree of research failure and uncertainty within the research and development of Alzheimer’s disease treatment drugs might hinder the growth of Alzheimer’s disease treatment market. The Alzheimer’s disease treatment market is in the growing stage with several international players operating in the Alzheimer’s disease treatment market. According to Centres for Disease Control and Prevention (CDC) the global prevalence of Alzheimer’s disease will triple among elderly patients, and the prevalence increases to 13.8 million by 2050. Several drug molecules lost patents and few more expected lose patents in near future, which is expected to crate market opportunity for generic players. Majority of drugs in pipeline failed in the late stage of clinical trials, for instance, Eli Lilly’s solanezumab and Pfizer/Johnson & Johnson’s bapineuzumab have failed to prove the disease-slowing effects in the late-stage of clinical trials. Moreover, In 2014, FDA has approved cholinesterase inhibitors (Exelon, Aricept, and Razadyne) and memantine for the treatment of cognitive symptoms in Alzheimer disease. The other medication is Namzaric (combination of donepezil with memantine) manufactured by Allergan for the treatment of Alzheimer’s disease. Researchers are looking for new ways to treat Alzheimer’s disease to address the Alzheimer’s disease market needs. Currently available drugs help mask the symptoms of Alzheimer’s disease but they do not stop its progression. There are several promising drugs in developmental and testing stage for Alzheimer’s disease, but researchers need more funding of research to ensure that fresh ideas continue to fill the pipeline. Geographically, the Alzheimer’s disease treatment market has been segmented into following regions Viz. North America, Europe, Asia-Pacific, Latin America, and Middle East & Africa. According to the United Nations Population Fund, the people aged over 60 make up for 12.3% of the world’s population, which is estimated to exceed to almost 22% by 2050, with the increase in geriatric population the market for Alzheimer’s drugs expected to bolster during the forecast period 2017 to 2023. North America contributes the maximum demand for Alzheimer’s drugs. According to the American Alzheimer’s Association, almost 5 Mn adults are suffering from Alzheimer’s disease and due to the increasing aging populations, it may expect to grow in future. Similarly, increasing coverage of Alzheimer’s disease by Medicare, an insurance program encourages more Alzheimer’s patients to seek medical treatment, expected driving market growth. According to Alzheimer’s Association UK, there are 850,000 people with dementia in the UK in 2015 which is expected to increase to approximately 1 Mn during forecasting period which expected to contribute significantly to the overall growth of the European Alzheimer’s disease treatment market. 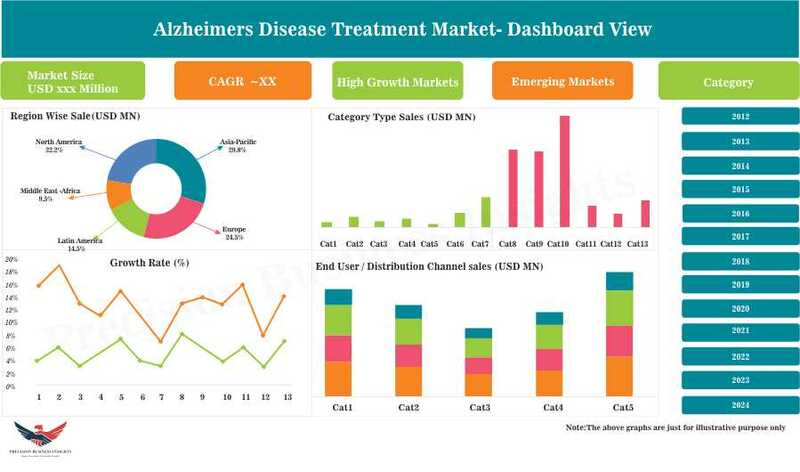 Some of the players in global Alzheimer’s disease treatment market are F. Hoffmann-La Roche Ltd (Switzerland), Novartis AG (Switzerland), Eisai Pharmaceuticals Co. Ltd. (Japan), H. Lundbeck A/S (Denmark), Johnson & Johnson Services Inc., (U.S.), AstraZeneca (U.K.), Pfizer Inc. (U.S.), Forest Laboratories (U.S.), and Eli Lilly and Company (U.S.) to name a few.